My kids love these and have even been known to ask for them for birthdays. I like that the filling can be made ahead of time and is ready to be stuffed into a pita whenever someone needs to eat. If you need to pack it up, it’s a welcome change from lunch meat sandwiches. I pulled the recipe from a 1999 Taste of Home magazine. I didn’t measure any of the ingredients, but I’ll give you the actual recipe. Cook the broccoli until tender. Drain and run cool water over it to stop the cooking process. 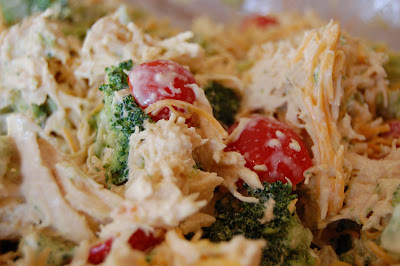 In a large bowl combine the broccoli, chicken, cheese, and tomato. In a small bowl stir together the mayo, mustard, salt and pepper. I always end up having to make more of the sauce than what the recipe calls for. 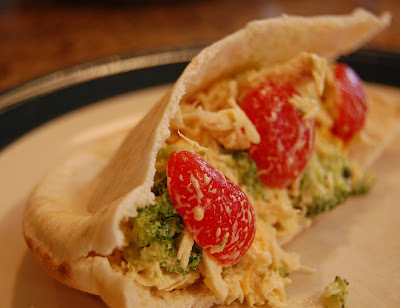 Stir the sauce into the chicken mixture and stuff into pitas. We like to eat these with Sun Chips. Oh my gosh, that looks so great! yum!! wow, it’s that good, they ask for birthday. okay, I’ll have to try that. My son somehow outgrow broccoli. He use to love broccoli. Mmm! I reall want to try this one! It looks delicious! I could easily make this! 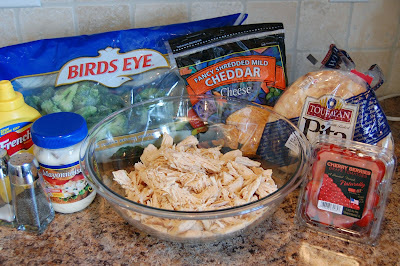 I think I have all the ingredients on hand except for the pitas. Made these last night. Another variation I want to try is to use ranch dressing instead of the mayo. I was wanting a little more flavor in the sauce. That would be good!